I think I’ve tried just about every natural toothpaste out there. SLS-free, fluoride-free, mint, wintergreen, baking soda, whitening…everything except cinnamon. I really liked Earthpaste for its clean ingredient list: Redmond clay, salt, essential oils, and xylitol. But I just can’t justify paying $5-6 for a tube of something I can make myself, for way cheaper, in about 10 minutes. 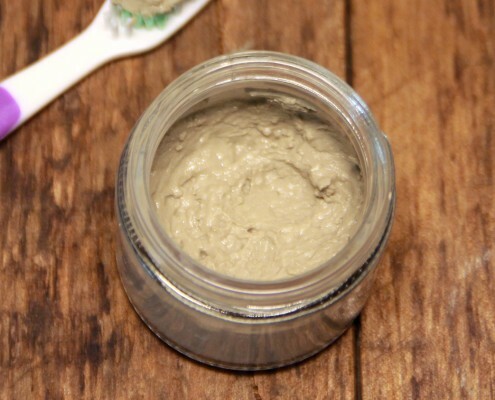 This homemade toothpaste recipe lasts me about a month, with two tooth brushings per day. If you’ve never used mud toothpaste, it does take some getting used to. It doesn’t foam up, and you do have to make sure you rinse your mouth really well to prevent feeling residual grittiness on the back of your teeth. But I LOVE how clean and smooth my teeth feel after using it. And you don’t need very much—just a dab will do.